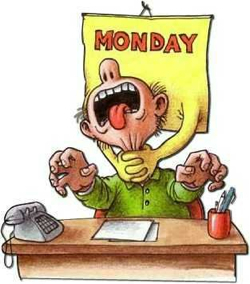 Manic Monday? Follow the ‘Take It Easy’ Policy…. At the breakneck pace at which our daily lives travel, Monday mornings are simply a magnified version of the turmoil in us. Being patient on a Monday morning, therefore, may seem like a feat. In reality though, whether it is a Monday or any other day, patience is the only way to connect with Life’s beauty and magic! A business associate who leads HR in a large client company called me unusually some time back. It was around lunchtime here in India. I was perplexed. Normally this gentleman would text me or write me a mail. I did not pick up his call as I was at lunch. After lunch I found a message from him that said he was just calling to say hello! I called him back! My friend here has just stumbled upon Life’s greatest secret: that taking Life as it comes is better than expecting it to go to clockwork precision. There really is no point in fighting Life. Because it is a zero-sum game: you can’t win against Life and Life was never playing to win! Life’s beauty lies in things as they are, in people as they are, in events as they happen. When things don’t go your way, accept them for the way they are going! This attitude will ensure that you practice patience in each situation__however stupid or serious it may be. We all go through mad, manic Mondays or simply, some bad-hair days! The traffic snarls. The heat, especially at this time of the year, in India can be cruel. Everything, everyone can be driving you crazy. Patience then is the secret to experience peace. It is in fact the only way to live intelligently. A cool song composed by A.R.Rahman from the 1994 movie ‘Kadhalan’ (‘Hum Sai Hai Muqabala’ in Hindi) comes to mind. The catchy lyrics had this inspirational line – ‘To win in Life you need a Take It Easy policy’! And whatever is driving you nuts or not going your way this Monday, get inspired by this song, and my friend’s experience, and simply ‘Take It Easy!’…. Author AVIS ViswanathanPosted on May 20, 2013 March 14, 2016 Categories Art of Living, http://schemas.google.com/blogger/2008/kind#post, Hum Sai Hai Muqabala, Inner Peace, Intelligent Living, Kadhalan, Manic Mondays, Take It Easy PolicyLeave a comment on Manic Monday? Follow the ‘Take It Easy’ Policy….